Canada won its second straight match at the men’s volleyball World Cup in Japan on Tuesday, defeating Iran 25-23, 29-27, 26-24. 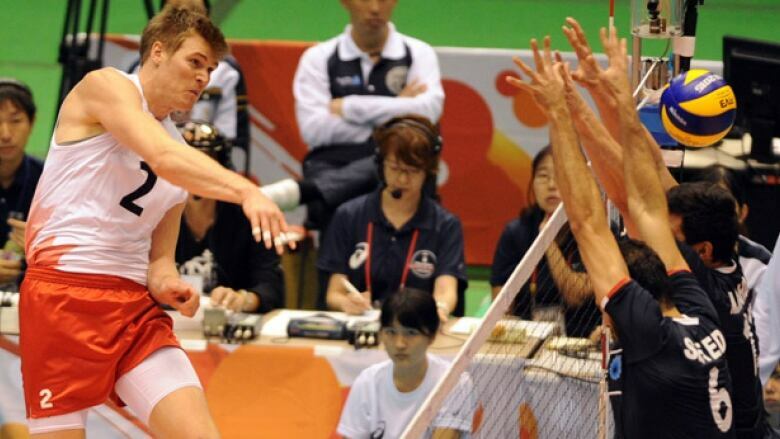 Canada won its second straight match at the men's volleyball World Cup in Japan on Tuesday, defeating Iran 25-23, 29-27, 26-24. The victory in Tokyo improved Canada's record to 4-6 with one match remaining. Two berths in the 2016 Rio Olympics are at stake in the 12-team round-robin tournament, but seventh-place Canada can not reach them. Canada can still make it to Rio via its regional qualifier, which takes place in Mexico in early October. Gord Perrin led Canada with 13 points against eighth-place Iran (3-7), while Justin Duff, Gavin Schmitt and Nick Hoag each had 12. "It was really a team effort," Perrin said. Canada will close out the tournament against Tunisia on Wednesday. The race for the all-important top two spots is going down to the wire after unbeaten Poland rallied from one set down to beat Japan 24-26 27-25, 25-21, 25-19 and maintain its grip on first place. Bartosz Kurek scored 18 points as the world champions improved to 10-0, a game ahead of the United States, which moved to 9-1 with a 25-23, 26-24, 25-17 win over defending champion Russia (7-3). Italy, also 9-1, is in third place because the United States has a better record in sets. The Italians came away with a hard-fought 22-25, 25-20, 25-21, 20-25, 16-14 win over Argentina. Poland will face Italy on the final day of competition while the U.S. takes on Argentina (7-3).